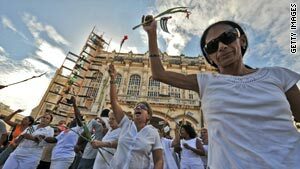 'Ladies in White' march on Thursday in Havana. Havana, Cuba (CNN) -- A few hundred pro-government demonstrators swarmed Havana's streets on Thursday, encircling a small group of female protesters marching in support of International Human Rights Day. "This is an intolerant, totalitarian government," Cuban dissident Laura Pollan told CNN from her home, where the march began. "They don't want democracy, they don't want other people to express their ideas, they don't want freedom of movement." The Ladies in White -- as they are referred to because of their all-white attire -- are mothers, sisters and friends of jailed dissidents in Cuba. In a seemingly coordinated event, the women waited for journalists and embassy diplomats to gather outside Pollan's home in Old Havana before marching. The women, who clutched long-stemmed flowers and tiny Cuban flags, drew hundreds of angry pro-government demonstrators seeking to drown out their chants of "freedom" by yelling "this street belongs to Fidel (Castro)." Small groups of women clad in white march every Sunday to protest a government crackdown in 2003 in which 75 leading political dissidents were imprisoned. Rarely do their protests draw such attention. The Cuban government identifies the Ladies in White as counter-revolutionaries in the pocket of the United States. "They are mercenaries," yelled one demonstrator who did not give his name. "They are paid by the United States of America, the same country that has a blockade on us, who threaten our children, who have killed more than 2,000 Cubans." The United States has maintained a near half-century embargo against Cuba that many on the island nation often blame for their country's woes. In a separate march, several people were tossed into vehicles while others were detained. British diplomat Christopher Stimpson said he observed screaming and "people being carried off" as he was mobbed by pro-government supporters. Thursday's Ladies in White march lasted about two hours, much of which was spent shrouded by the mobbing crowd of demonstrators. "It's much easier to use pro-government supporters, because it shows that the demonstrators' view are not shared by the general population," said Susan Purcell, Director for the Center for Hemispheric Policy at the University of Miami in Florida. Purcell noted that "if you have citizen against citizen, then the regime can claim deniability." Despite minor pushing and shoving between the groups, no injuries were immediately apparent. The Cuban Human Rights Commission estimates Cuba is holding 200 political prisoners.